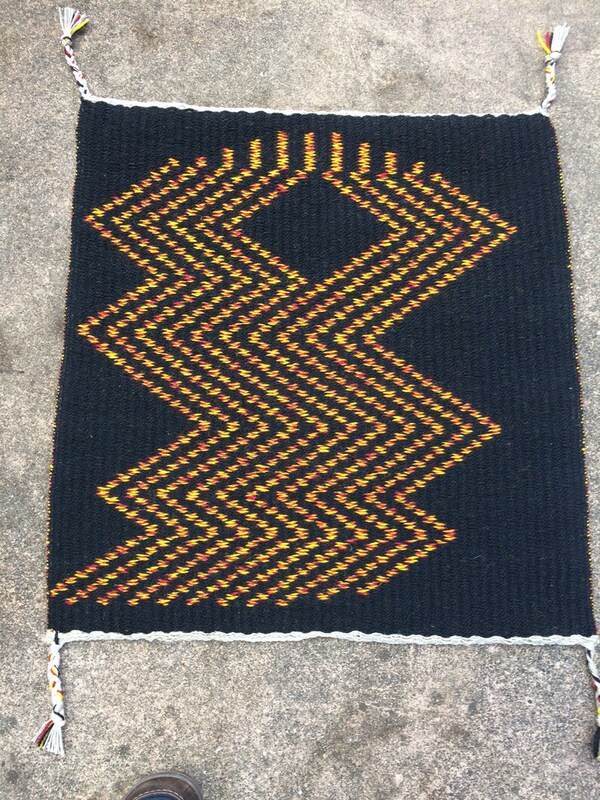 Handwoven Rug, Black, Red, and Yellow Natural Dyes in Geometric Pattern. Two Rugs in One. 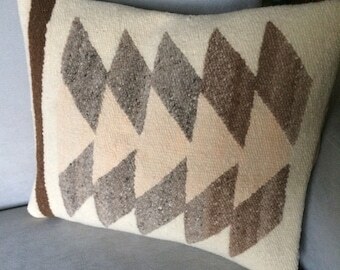 One side has a black background with red and yellow geometric design. Turn it over and it has a yellow and red background with a black geometric design. My own design, created from trips to Napa and Sonoma, the Starling Flocks of Birds that create moving clouds. If you've never seen it, that alone is worth the trip. When you first see it you immediately think clouds can't be moving like that and that quickly, dipping and rising. Then you drive on and get a bit closer and you realize it's flocks of birds. Hundreds of them, all flying so close together that it looks like a dark cloud in an otherwise blue sky. This piece is those flocks of birds. At one point they break apart and go in opposite directions. Then they come back together, rise upward and fly off the rug. Piece measures 24" wide and is 25" long. 100% hand dyed wool, using natural dyes. There is a braid at each corner.